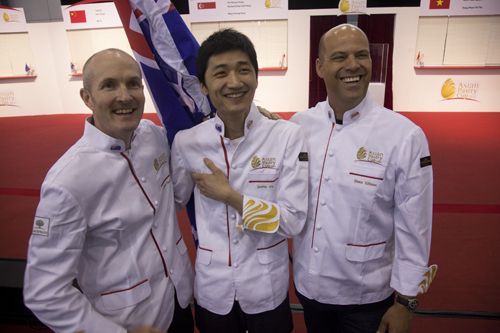 At the heart of Team Pastry Australia (TPA to the initiates), is Team Manager Jian Yao, Director of Continental Patisserie, who has been involved for numerous years in the competition world, be it with Chinese or Australian teams. 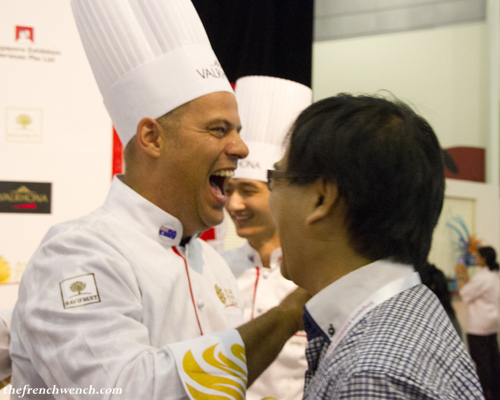 Together with Team Coach Dean Gibson, Jian has poured his heart and soul into the enterprise, working tirelessly to raise money, organising international trainers to come to Sydney, to ensure that the team can train in the best conditions possible. 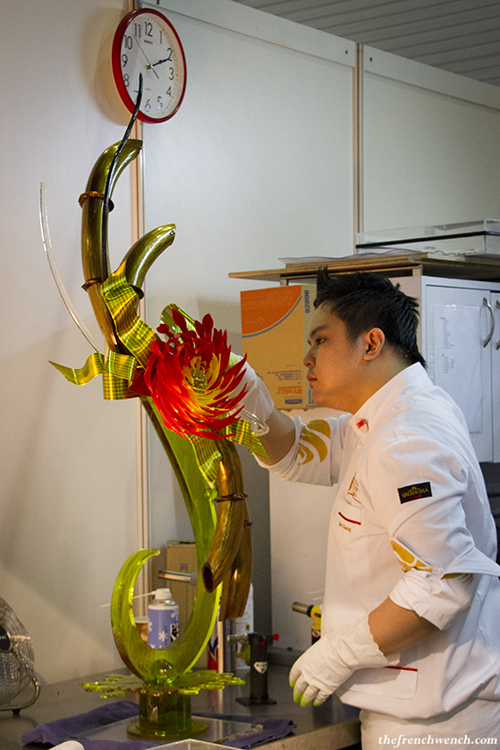 Team Coach Dean Gibson (Pastry Teacher at TAFE Newcastle) had himself competed for Australia with long time friend Adriano Zumbo in Singapore in 2010 (see my post about it here). 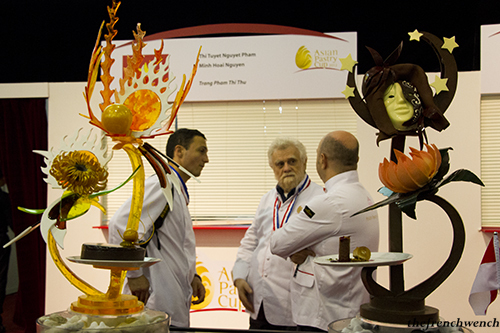 Unfortunately they narrowly missed a spot to compete in Lyon. This year Dean was not only determined for the team to qualify to the World Cup, but to beat all the other Asian teams and win Gold! 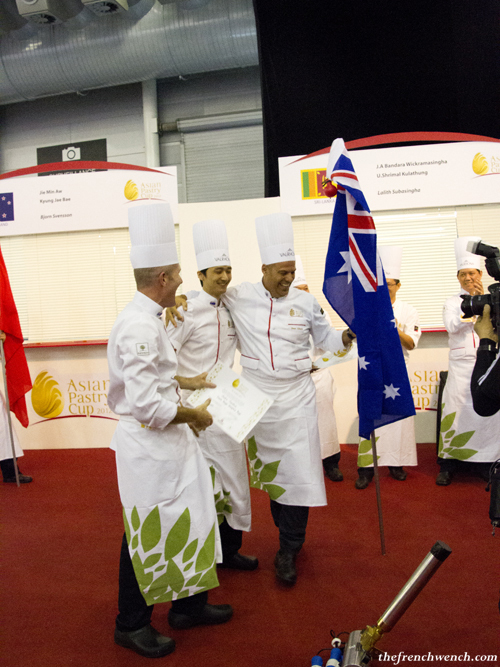 After a day dedicated to official photo shoots and the Opening Ceremony of the Asian Pastry Cup, the actual competition ran over 2 days: 6 teams were to compete on the 1st day and 5 teams, including the Australian team, on the 2nd day. 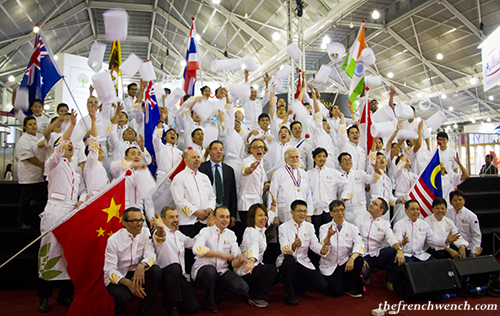 The jury was composed of one member of each each country, and was presided by Gabriel Paillasson, President and founder of the World Pastry Cup, who made the trip especially from France to attend the competition. 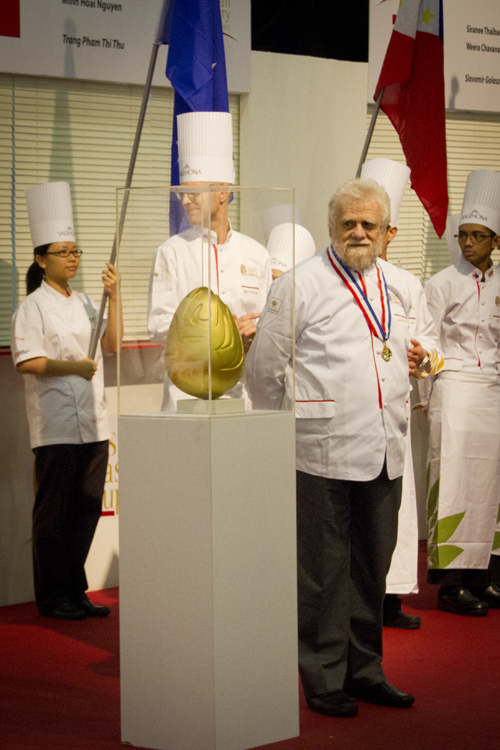 Gabriel Paillasson himself is a MOF (Meilleur Ouvrier de France), with a career in pâtisserie spanning over 50 years. 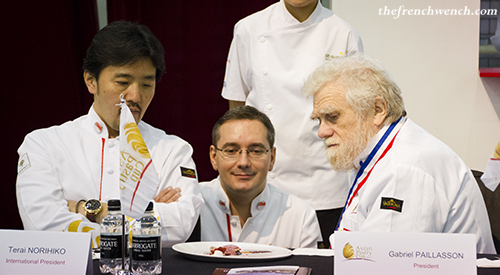 He was accompanied by Chef Terai Norihiko, renowned Pastry Chef from Tokyo, the international president of the World Cup. 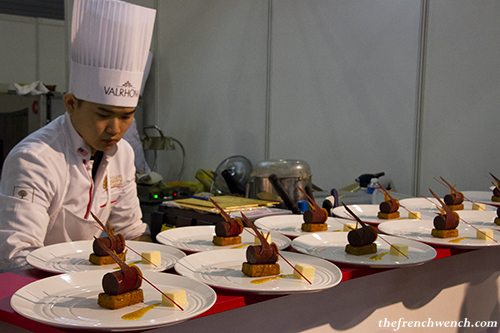 The teams first had to prepare the plated desserts for the judges. 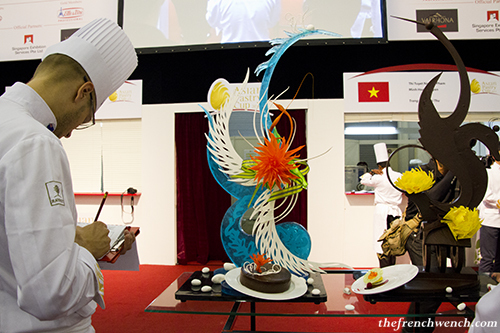 A very well orchestrated army of staff and pastry students were lining up to carry all the desserts from the team booths and put them all simultaneously on the judges’s table, conferring to the tasting a very ceremonious aspect. 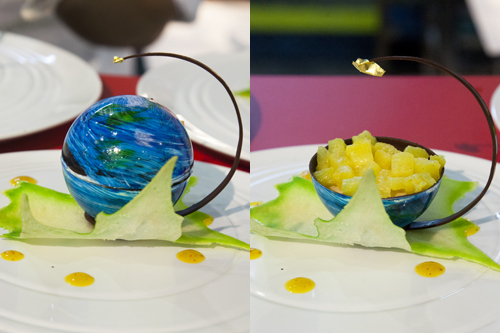 All the desserts looked very sophisticated and original, with chocolate spheres, foams, jellys and a fair few Ferran Adria style of microwaved sponge cakes! 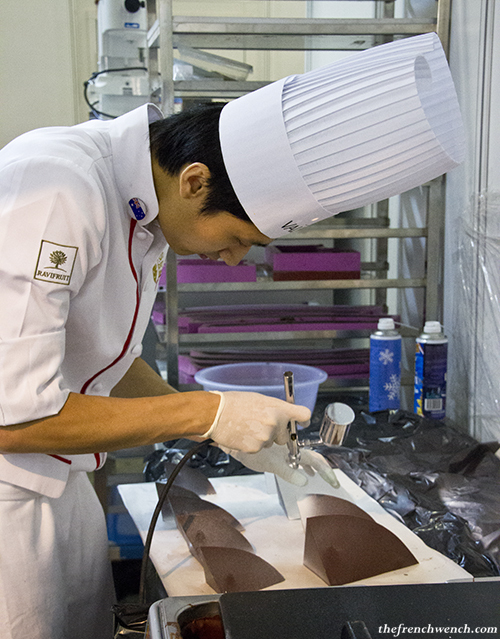 Singapore has won the Asian Pastry Cup since it was created: in 2006, 2008 and 2010! They certainly were the team to beat! 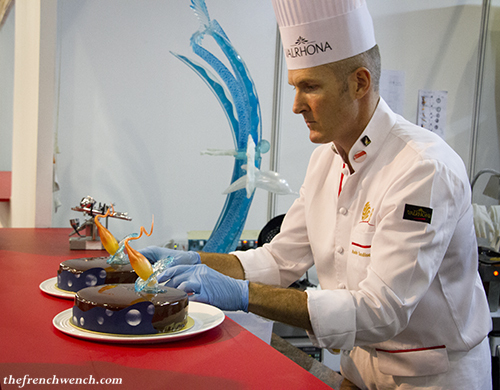 We also had the presence of another renowned pastry chef, Luc Debove, who is not only a MOF in ice-carving but also a World Champion in the same discipline! 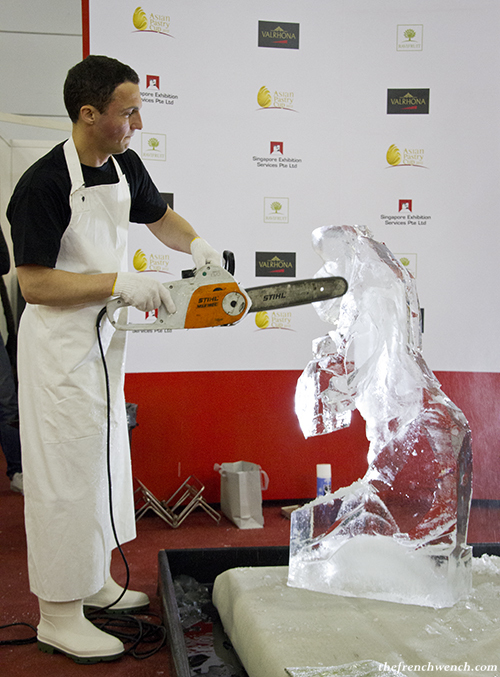 We were able to see some live action ice carving by World Champion and MOF Glacier Luc Debove, who sculpted a Pegasus sculpture out of a huge block of ice. It was an impressive show of skills, but he was very modest about it (“Oh I’m just playing around with ideas… etc”)! The 8-hour timeframe can seem like a long time to produce all these pieces, but it is actually really short and unforgiving. A few spare minutes can make all the difference to obtain a spot in the first four. 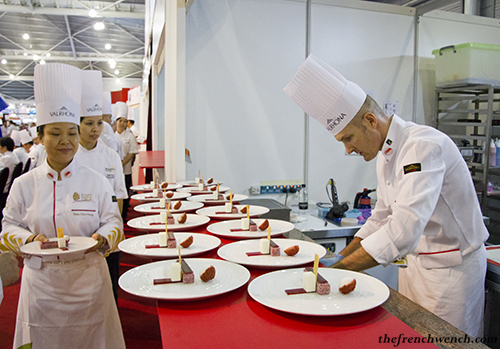 In order to save precious minutes, chefs don’t even take toilet breaks! 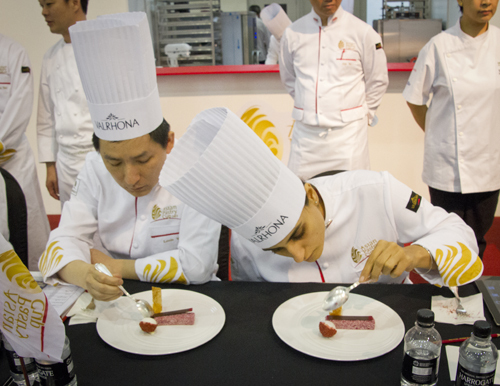 It was then time for the teams to plate the chocolate entremets. 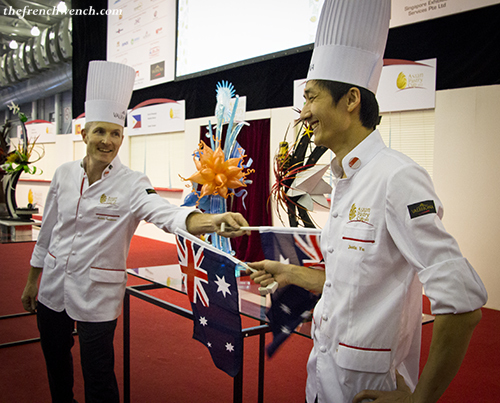 The Australian team presented an unusual chocolate cake, in that it contained sago (a bit like tapioca). Sago is a very common ingredient in Asian desserts, but paired with chocolate, it sounded like an intriguing combination… and a bit risky! 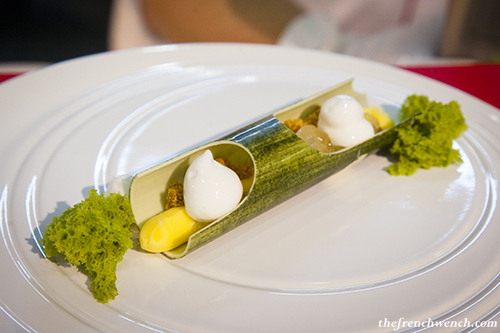 It didn’t prove as popular as their plated dessert, but it certainly had people talking! 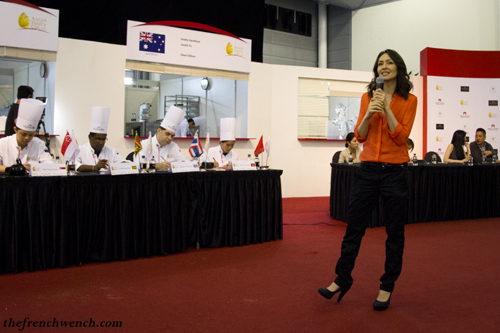 The fabulous host, Angela May, describes each dessert to the audience. 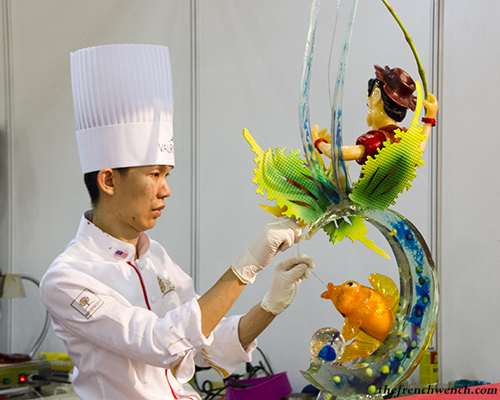 The last stretch of the competition saw the teams trying to finish their showpieces in time and carry them (intact!) to the display tables. 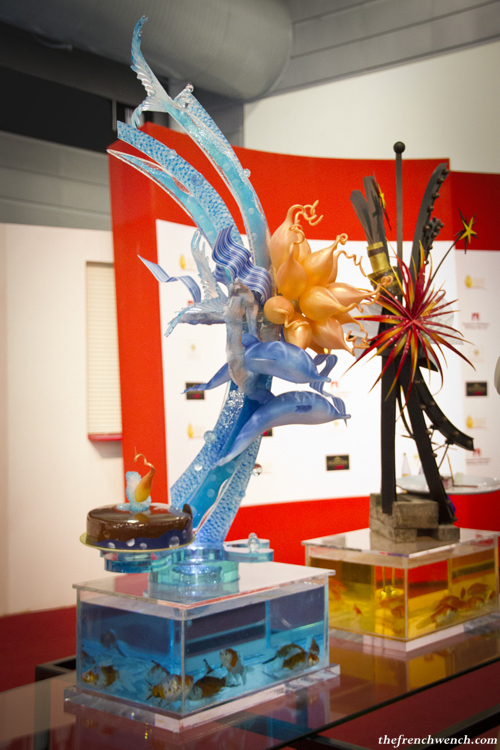 Both showpieces from TPA were themed on the Sydney Harbour: the chocolate piece was to showcase the architecture of the Harbour Bridge with the famous NYE’s fireworks, and the sugar showpiece, the marine life of the harbour, with dolphins, water, anemones and coral. Unfortunately, about 30 minutes before the end, Justin had an incident with his fireworks explosion, which fell and broke into little pieces, but he quickly recovered and soon started another smaller one. 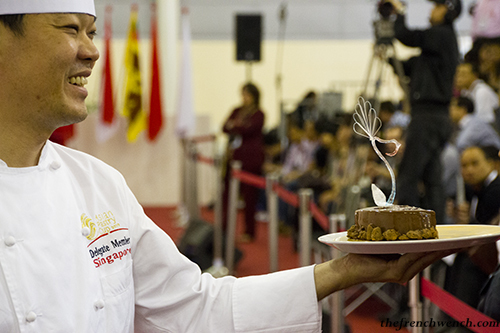 He was really disappointed but his calm and collected attitude impressed the judges. 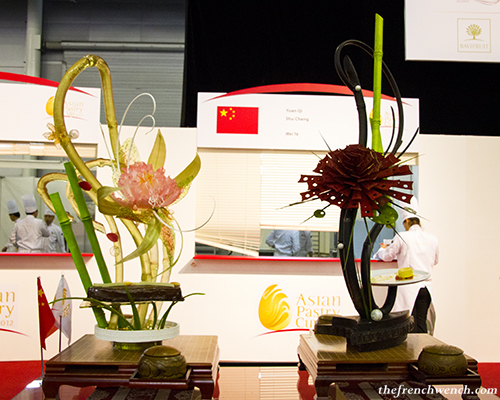 André, who had finished early, helped set up the table: for an even more striking visual effect, the team had decided to fill the tanks with live little fish, representing the fauna of the Harbour. In the end, both pieces were transported to the table successfully (despite a mini-bump which caused a tiny piece of anemone to fall and a few hearts to skip a beat!). And so it was all over! 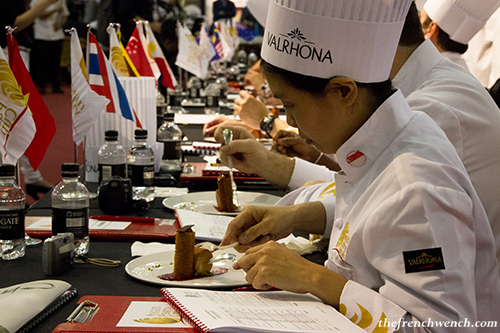 The teams had done all they could and their fate now laid in the hands of the judges. 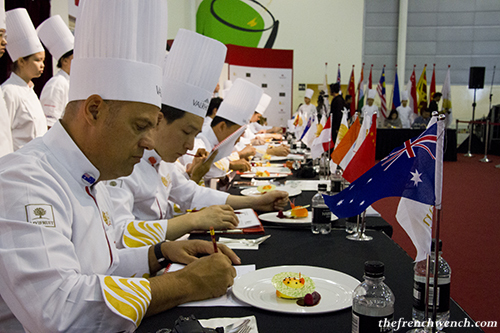 The judges retired to give their marks and soon after, the awards ceremony started. 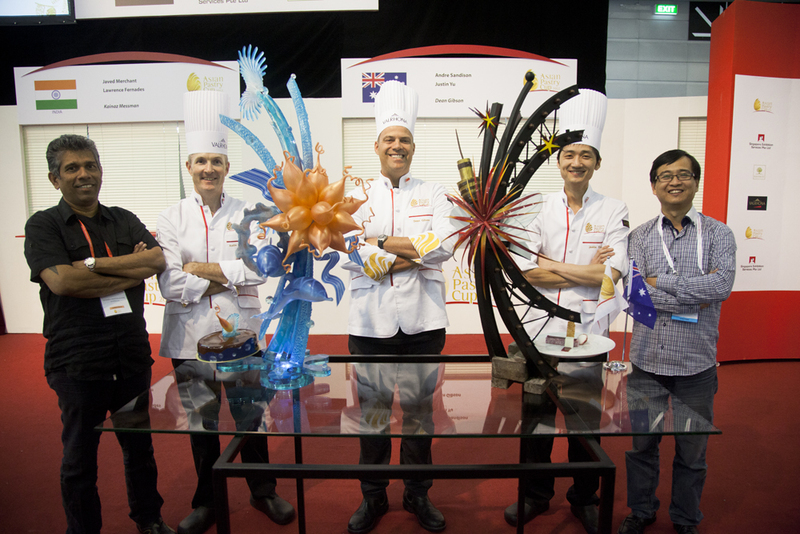 The presidents and sponsors first announced the special prizes, amongst which Australia won “Best sugar showpiece” and the Media prize. Finally, it was time to start the countdown to 1st place! The 4th place (or “Wild Card”) went to New Zealand. 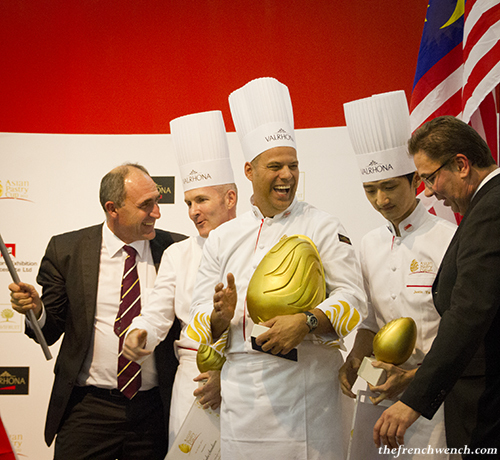 The 3rd place was awarded to Singapore. 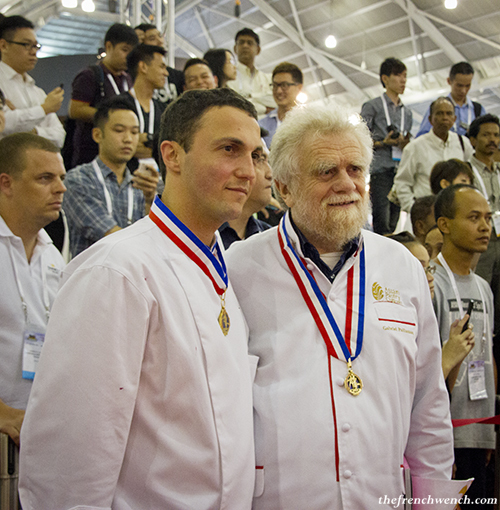 and the 1st place….. went to………..
Next step: the World Pastry Cup in Lyon! To be continued in January 2013! 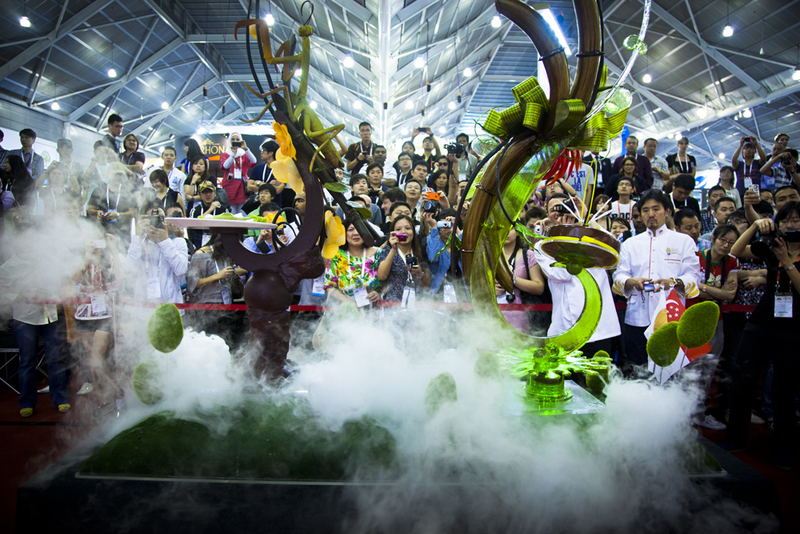 This entry was posted in Events and tagged Asian Pastry Cup, pastry, patisserie, Singapore, Team Pastry Australia. Bookmark the permalink. 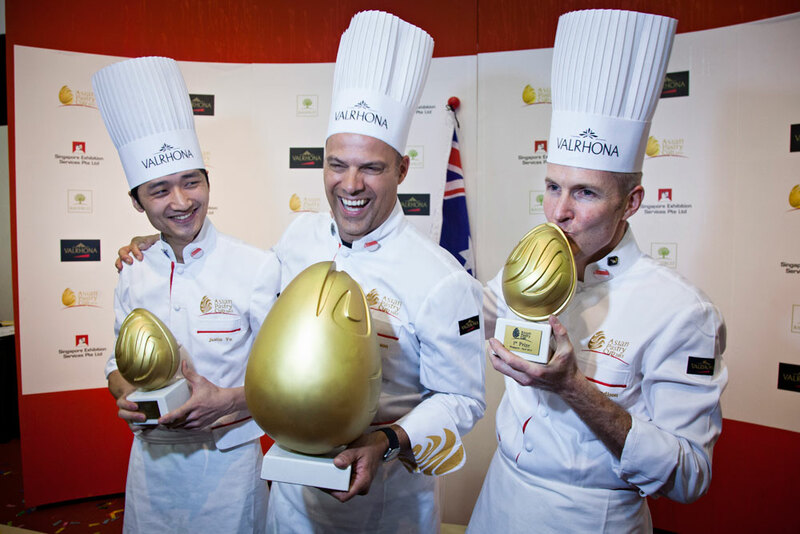 It sounds like the culinary Olympics! What a well orchestrated event. And it must have been wonderful to see it first hand. Excellent photos – thanks for sharing. It really was like the Olympics, those guys train like mad to get to that level! Hi Sarah! 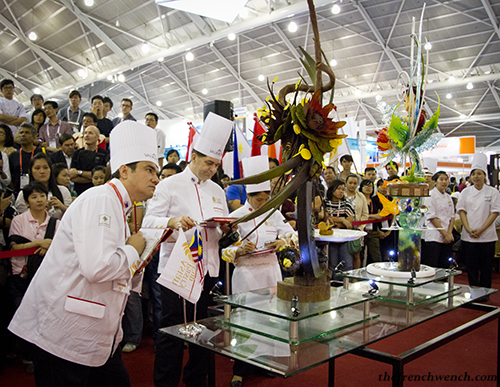 After the competition, I assume the showpieces go to the bin, really. You can eat bits of them, but I was told the sugar they use for the sculptures makes you go to the toilet… and you don’t want that! 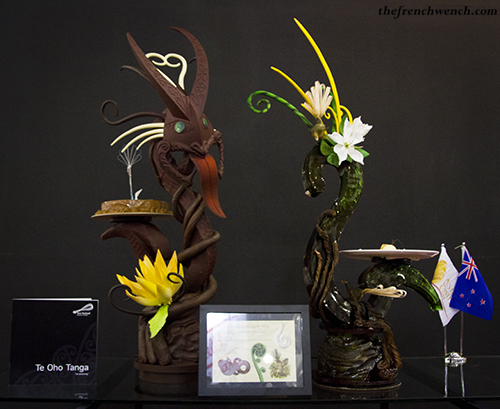 The chocolate is fine to eat, but funnily enough, the last thing I wanted that day is eat chocolate! 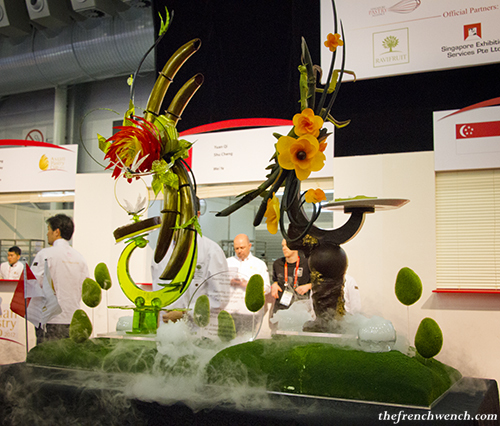 But at the Chocolate Festival at the Hunter Valley a few weeks ago, the audience was able to eat bits of the chocolate showpieces and it went quite quickly! Just found your post after hearing last week that Australia achieved 7th place in Lyon! It’s very exciting. I’m studying patisserie at TAFE and amazing to know that Dean, the team coach, is a TAFE teacher. When I think of the finger buns I ate as a kid in the 70’s I can’t stop thinking the times…they are-a-changing…. Hello Balade Sucrée, thank you for your nice comment! 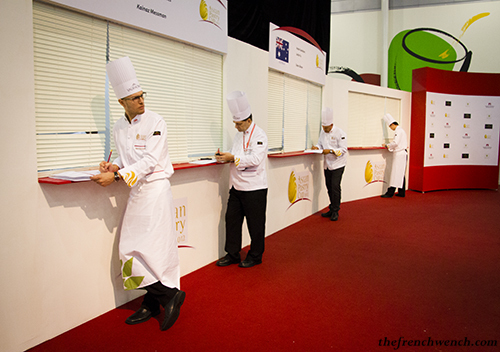 Pastry is definitely changing in Australia, and for the better! Hello! Stumbled upon this site and though it was extremely cool. 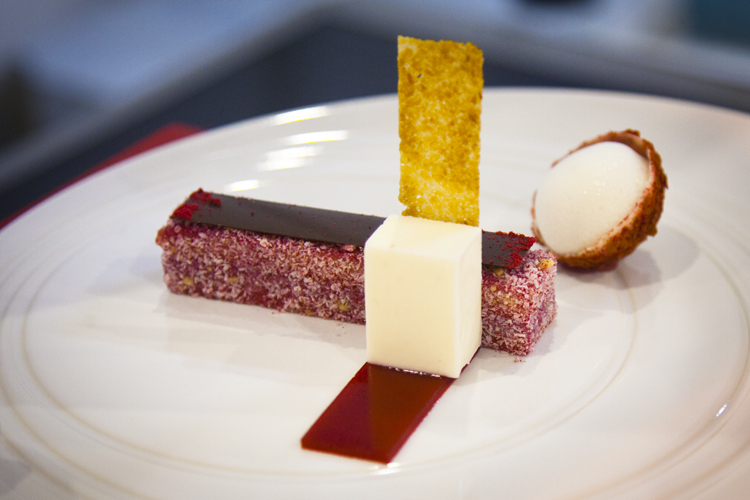 I love the look of the raspberry coconut lamington dessert! It is so creative and amazing! The only thing I don’t know on that dessert plate is that brown cracker between the marshmallow and the lamington. If possible, could you please tell me what it is? I am very curious of what it could be.